It’s one of those moments where I begin to think “I get where my mother was coming from” when I realise the satisfaction I get out of an orderly (not spotless – my family doesn’t do minimalist), every thing / paper / book has a place and it’s actually in it. The car looks shiny, and looks loved. I think perhaps it was also the activity of doing the cleaning & clearing out which I enjoyed, some strange catharsis in clearing out old papers (some from when I was in the process of applying for teacher training) and a feeling of “I’m beyond that stage now”. Those things that sent me round the bend (tackling the minefield that is moving from benefits to student funding) are now just a memory… somewhat serves as an aide memoir regarding things that I consider currently trying (DD is in the ‘why’ phase!!!) one day I’ll be past them also. There’s other things that I find harder to step away from, a song, a thought, a time of year can all throw you back into the midst of things, so I’m going to try and remember the moving-on feeling from clearing my room, and thoughts of preparing for new adventures (as in washing my car). The joyful thing about car washing when you have a child is that it is not a solo activity – we had great fun with the hose, bubbles and sponges (seeing who could do the loudest squeak on the bodywork of the car today!) Things that seem too mucky to deal with alone can be lightened with the help of other people. Again, the big divine dig-in-the-ribs where I’m reminded that I’ve/we’ve not been asked to do this alone… we’re made to live in community with others, and involve the divine in those relationships. 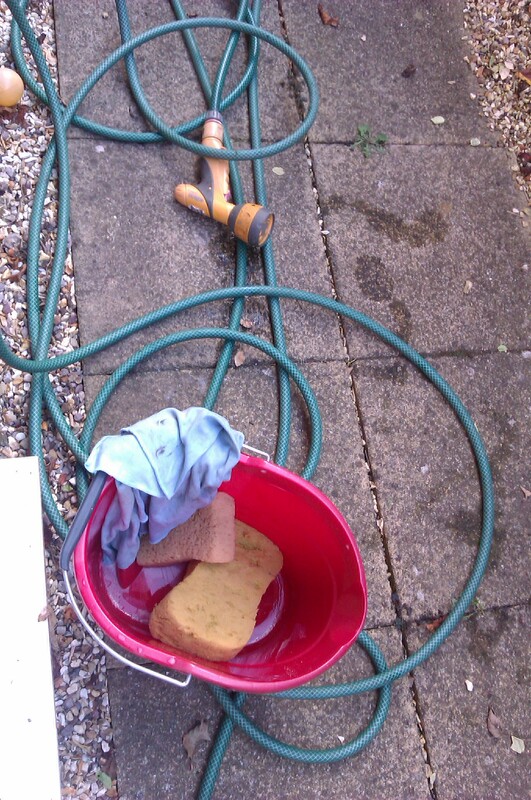 Do you need to ask a friend or a relative to ‘grab a sponge’ and help you with the muddy bits? New term is fast approaching – as for me I’m investigating the teaching of phonics this year as a move of key stage means that will play a bigger part in the daily routine. Also DD is beginning her school career… so it’s a time of new beginnings. Inspired by a wordpress blog I’m seeking to stimulate my blogging activities with a photo-a-day; some I’ll snap myself, others I imagine I’ll find in papers and other media which catches my attention. 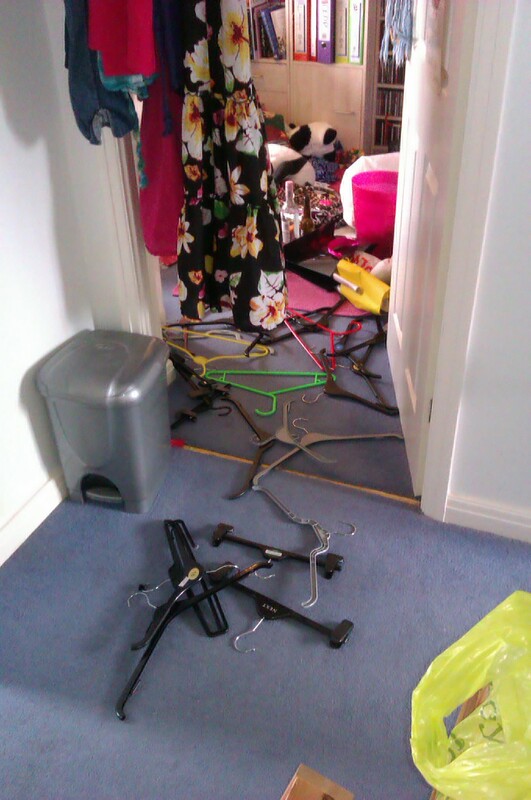 I’m organising my room to get myself ready for the new term; it always seems to look worse before it looks better. I’ve also gone through my wardrobe (rather ruthlessly I might add) ditching (to go to the charity shop) those things that I pick up … look at… then place back in there. Why do I do that? Am I the only one? Anyway, I’m sure most of it will find happy homes where it gets worn again and a charity will gain in the process – win win. There’s something rather sad about a piece of clothing, or a pair of shoes / handbag which doesn’t get used… I somewhat feel it’s depriving it of a purpose. Enjoy the pic, I’m diving back into the heap to sort it out a bit more!